A stroll through the best market in Santiago de Compostela, the Mercado de Abastos, is essential to understanding Galicia’s fishing and agriculture-based culture and is a great way to scope out the local delicacies. 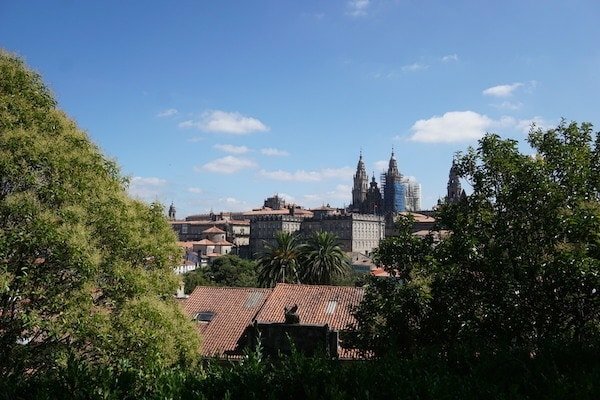 Located on the eastern edge of Santiago’s Old Town, the Mercado de Abastos (Rúa das Ameas) boasts eight different indoor halls filled from end to end with Galicia’s finest commodities. Spice vendors spill out into the open-air passageways between halls, while florists set up shop in the nearby church plaza. 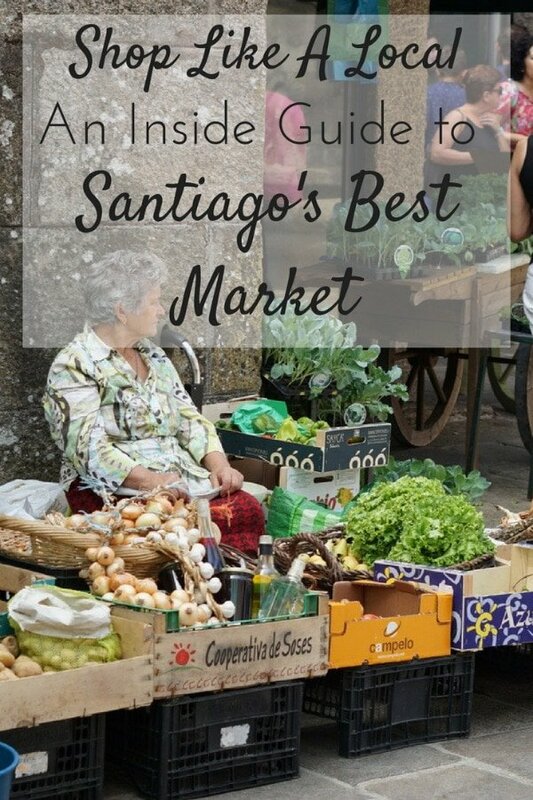 It’s no wonder that visiting the best market in Santiago is the top things to do in the Galician capital! As you enter the best market in Santiago de Compostela from Rúa das Ameas, you’ll first come across a hall of butchers. Cattle, pigs, and sheep roam freely on Galicia’s massive hills and pretty much everyone who has a bit of land raises chickens! Galicia’s high-quality beef is sought-after throughout Spain, and traditional recipes for pork shoulder (lacón) and pork cheek (cacheira) are served all over the country a la gallega, or “Galician style.” Ask your vendor for recipes! Whole chickens, eggs, and mouth-watering charcuterie can also be found in this hall. If there is one word you learn in Galician, let it be queixo, or cheese. If happy cows make the best cheese, Galicia’s free-roaming cows must joyful, because Galician cheese is amazing! 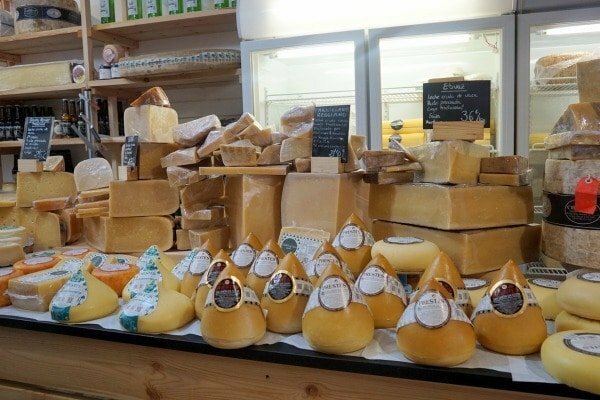 Try the typical Tetilla cheese or the creamy Arzúa cheese, made in the nearby town of Arzúa. A great selection of Galician cheeses! 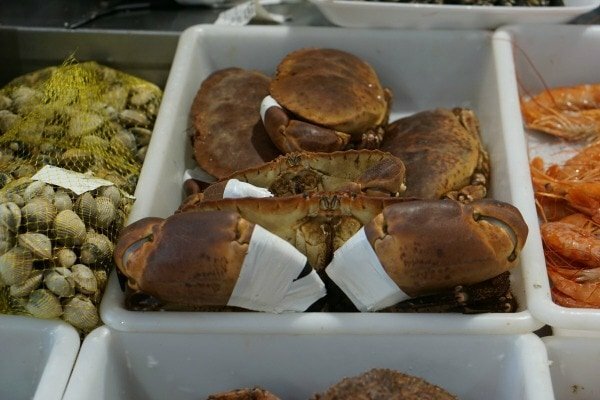 Next, walk through the two halls of fishmongers and witness the very freshest seafood in Spain, plucked straight from the nearby Atlantic Ocean and Rías Baixas. No, you’re not mistaken—some of the fish are still flinching. This section is not for the faint of heart! If you’re a shellfish novice, try the cockles, razor clams, mussels, clams and scallops. For more of an adventure, take a stab at the sea urchin, sting ray, or shark (marrajo and caella). If you have refined tastes and deep pockets, try the lobster, crab, and barnacles (percebes), which are dangerous to capture. You can’t go wrong with any of the fish. If you want to shop but don’t want to cook, take your selections to Mariscomanía, a restaurant in the hall across from the butchers’ area where the chefs will prepare your purchases for five euros per person! Hearty buey de mar, a type of crab. At the back of the market you’ll reach the produce stalls. 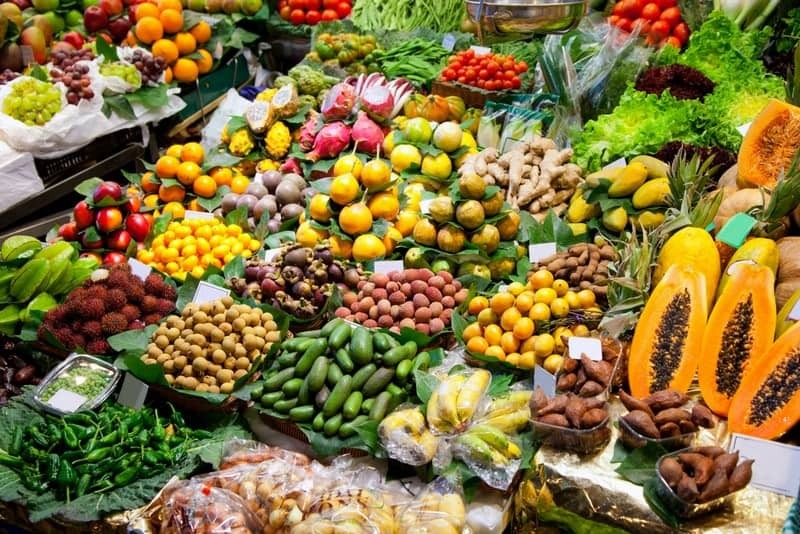 The fruits and vegetables are all so fresh and colorful that you’ll want to become a still life painter. Instead, buy some pimientos de padrón and find out the hard way whether or not you got a spicy one. 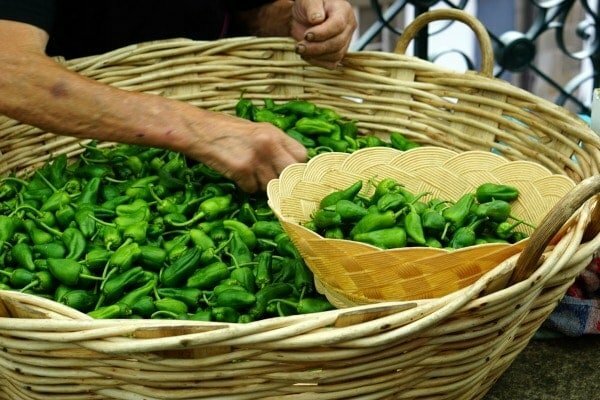 Pimientos de padrón: some are hot, some are not! 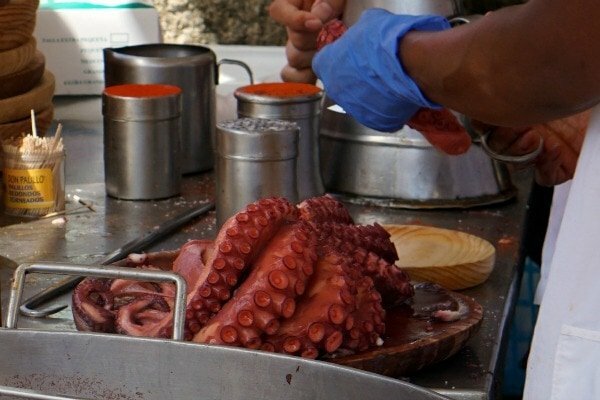 Join the cluster of people gathered around a pulpo á feira stand and watch the chef dip the fresh octopus into an enormous pot of boiling water exactly three times before slicing it, seasoning it and handing it over to an eager customer. You cannot leave Galicia without trying this traditional dish! Pulpo a feira, a Galician specialty! On the north side of the market, you’ll find a few stalls with artisanal products. Crafts and local artwork are great gifts for loved ones back home, but the very best edible souvenir (that is also easy to transport past customs) is Crema de Orujo, a cream liqueur made with traditional Galician aguardiente. 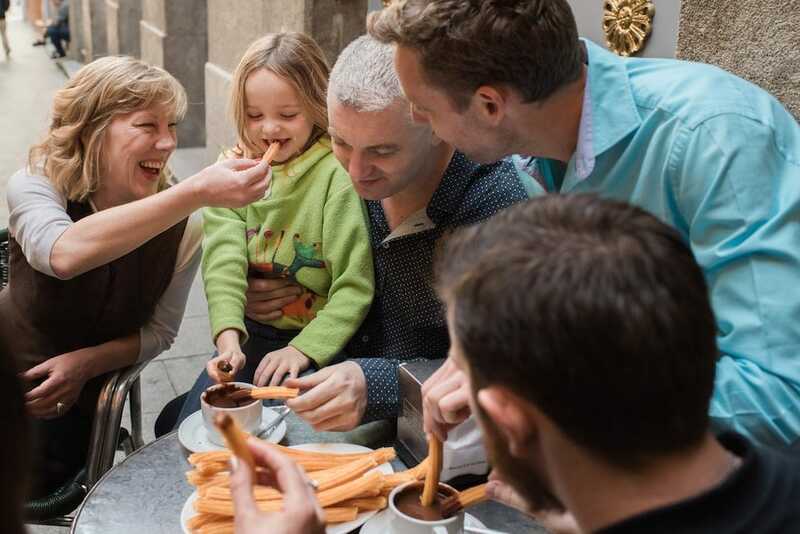 Galicians pride themselves on their locally-grown produce, superior seafood and delectable meats and cheeses. In fact, Galician products that have passed inspection receive the coveted label “Galicia calidade,” or “Galicia quality.” You can look for this label when you’re shopping throughout Spain! See Also: Keep the foodie fun going at these top gastronomy festivals in Galicia!